No, the BJP is not rattled by Rahul Gandhi. For many months now, the BJP responds in real-time to whatever Rahul Gandhi says and does. Every point he makes gets a rebuttal. The days when the BJP used to field only Smriti Irani against Rahul Gandhi are long gone. The BJP reacts so strongly to Rahul Gandhi that it makes you wonder if he is rattling them. Surely, many wonder, Rahul Gandhi must be doing something right? His supporters and defenders say Rahul’s critics have got it all wrong, he’s doing well, just look at the BJP’s reactions to him. But if Rahul is hurting the BJP’s prospects in 2019, why is the opposition so under-confident about him? The Congress party’s desire for a united opposition is a de facto admission that the party itself is not strong enough to take on the BJP in the 2019 Lok Sabha elections. The reluctance to say Rahul Gandhi should be seen as prime minister is similarly an admission that he cannot take on Narendra Modi. At Congress leader Kapil Sibal’s book launch Friday, opposition leaders agreed that the 2019 election will be “Modi versus India”. In other words, it won’t be Modi versus Rahul. These two things don’t add up. The BJP seems to be taking Rahul Gandhi more seriously than the opposition itself! The answer lies in the proposed national mahagathbandhan. It may be a pipe-dream, but is nevertheless a threat to the BJP. It has a proven track record in the Bihar assembly elections in 2015 and in the recent Lok Sabha by-polls in Uttar Pradesh. In quite a few states, a high index of opposition unity can threaten the BJP. These include Jharkhand, Haryana, Maharashtra, Bihar and of course Uttar Pradesh, where the BJP will definitely lose a chunk of seats thanks to the SP-BSP alliance. The strongest weapon in the opposition’s armoury is a mahagathbandhan. The weakest arrow is Rahul Gandhi. Obviously, the BJP wants to take on the weakest arrow. By saying Rahul Gandhi, Rahul Gandhi, Rahul Gandhi all day, the BJP wants to make it appear that they are up against Rahul Gandhi – and, by implication, not the opposition as a whole. The BJP is obsessed with Rahul Gandhi not because he’s a threat to them, but precisely because he’s an asset. Also read: Why exactly is Rahul Gandhi going on Mansarovar yatra at peak of Madhya Pradesh campaign? If the BJP were to ignore both Rahul Gandhi and the larger opposition, voters might start comparing Modi to his 2014 promises. It is important for the BJP to direct people’s attention somewhere other than Modi’s tall promises in 2014, and what better place than an opposition leader unable to come into his own? That stage hasn’t been reached yet. All surveys and opinion polls and chai shop banter say that Narendra Modi’s popularity is way ahead of Rahul Gandhi. The Congress president’s ratings have also surprisingly improved. That’s because anti-BJP voters have no option. Ironically, both Narendra Modi and Rahul Gandhi are benefitting from the TINA problem: There Is No Alternative. The BJP is willing to take this risk because it reflects its confidence in Rahul Gandhi to not succeed. Just as obsessing over Modi helps Modi, so much talk about Rahul should help Rahul. And it can – if only Rahul Gandhi knew how to seize the moment. When he should have been in Kerala, showing the BJP as being insensitive to the flood situation, he was in Europe, answering the old charge of the 1984 riots. When he should have been in Delhi to make an issue out of the fuel price rise and the falling rupee, and participate in his party’s Rafale campaign, he went to Kailash Mansarovar. He earned some brownie points with a hug and a wink but since then he hasn’t scored any points. When he should be strengthening his party’s campaign in Rajasthan, Madhya Pradesh and Chhattisgarh, he’s in Kailash Mansarovar. The more Rahul Gandhi goofs up, the more the BJP will obsess over him. The idea is to produce a contrast: Do you really think Rahul Gandhi is better than Modi? Those who want to make 2019 a ‘Modi versus mahagathbandhan’ campaign presume that they will be able to dominate the national narrative and force voters to see the mahagathbandhan as the answer to Modi. But Modi and his party are miles ahead in the narrative game. 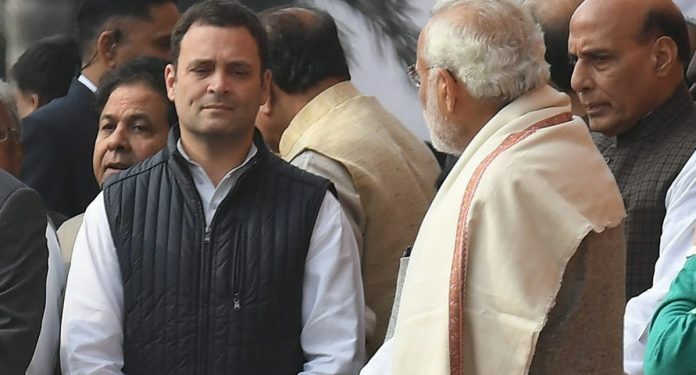 Through Modi’s superiority in oratory and in running WhatsApp groups, through a pliant media and a robust RSS network, the BJP will make sure the 2019 election is a referendum not on Modi but on Rahul. Guys just don’t click on articles from sites like THE PRINT , QUINT , THE WIRE etc . It only increases Thier income which write nonsense against Modi and praise mahathugbandhan and anti Hindu congress. Read QUORA for more information. Boycott all these medias. The English print media hardly ever had anything good to say both about NDA 1 and NDA 2. Why do you like to parrot a non existent phenomenon – pliant media, as truth. “Do you really think Rahul Gandhi is better than Modi?” Yes, I do – and so do millions of others. Rahul has his heart at the right place and that is exactly what we need now. Not a warmongering broad chest but an all uniting love and hug. Yes, Rahul is no match to Modiji as a damoguage. Rahul raises questions of public concern which Modiji never replied. He does not take Rahul worthy of an answer. But the thing is these questions relate to his tall promises which he could not fulfil. If he attempts to answer the hollowness will expose him. So, as a strategy Rahul Gandhi being insulted. This attitude towards him is earning sympathy and his popularity is increasing. The recent trend in escalating cost of living is another disadvantage for Mr Modi. On the whole, winning ensuing parliamentary elections is a hard task. They will divide the society on caste and faith lines and try to gain electoral benefits. But today the electorate has become wise enough to judge things on their own. By responding they are keeping a weak opponent.